Quintessentially British design and exquisite craftsmanship combine with the vintage-inspired Emmy London collection. 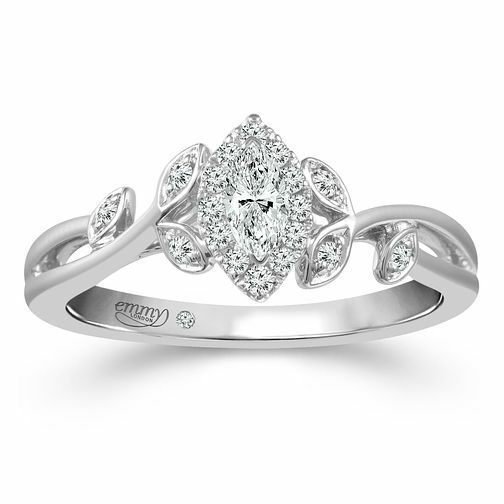 Crafted from platinum, this elegant diamond ring presents a charming update on a classic style. A majestic marquise-cut diamond centrepiece is surrounded by a glistening halo, whilst the platinum band features leaf inspired frames encapsulating more sparkling disamonds. A secret stone is set within the band, alongside the Emmy London signature. The total diamond weight of this ring is 0.25ct.